I need a way to list the offices and candidates on the form with the option to either select the candidate listed or a write-in. Could you please elaborate, (1) are your users going to write the candidates' names themselves (or write-ins instead of candidates), or (2) will candidates be pre-filled on the form with your users having the option to either select the default candidate, or to write in their own as a "write-in"? Will there be multiple possible candidates for each position? If there is a limited set of existing predefined candidates for each position, and you also wish to allow your users to input their own preferred pick that is not on the list, I would recommend using Radio Button fields with Allow Other option selected. 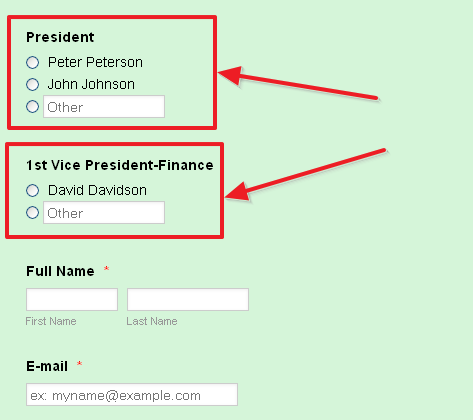 candidates to be pre-filled on the form with your users having the option to either select the default candidate, or to write in their own as a "write-in"? As my colleague mentioned you can use Radio Button fields to achieve that. When you add Radio Button field to your form you can set default candidate by clicking on Options button and entering name of you candidate. And you need to turn ON option Allow Other so that your users have option to write name of their own candidate. rows rather than a single column to make the form shorter. We can't add Radio Button fields into a Matrix or a table, but as I understand it - you are looking for a way to make your form shorter. You can use Field Positioning to Shrink each available Radio Button. You would do so by clicking on a Radio Button, clicking its gear-shaped icon, and clicking on Shrink. When this is done for all Radio Button fields, you will see that they are taking much less space - but they are not perfectly aligned and don't look professional yet. In order to fix it, we can go to our Designer (Setup & Embed > Designer). 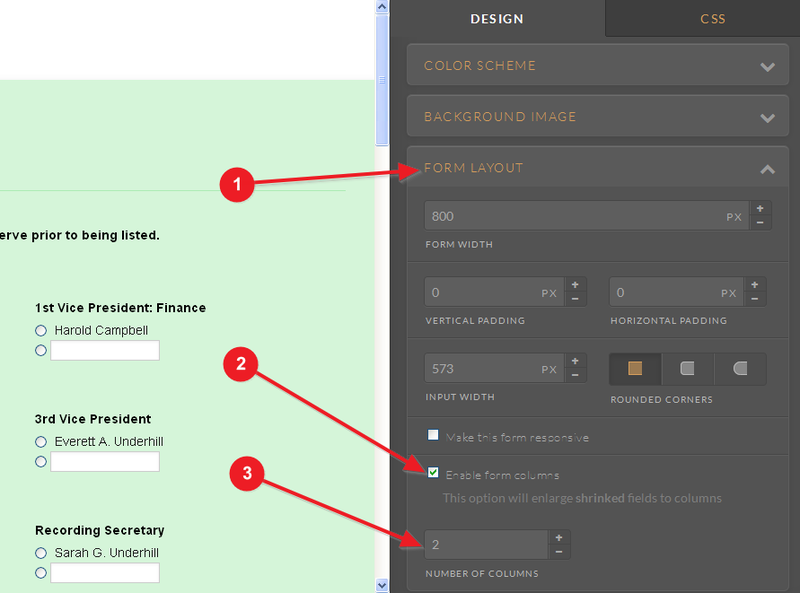 In the designer, we would click on Form Layout, and check the Enable form columns. This will make all your radio buttons appear neatly in multiple columns. You can select how many columns, 2, 3, or 4 are all nice choices. I hope this helps with making your form neater and shorter. Please let us know if you need further assistance. think our folks will like it. Please don't hesitate to contact us again should you need any other assistance with your forms, and we will be happy to help. options and none of them showed! Considering that your last issue is not related to your original, I have moved your question to separate thread and we will provide you an answer there shortly.